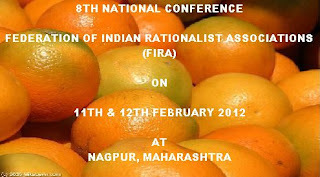 The 8th National Conference of Federation of Indian Rationalist Associations (FIRA) will be held at Nagpur, Maharashtra, on 11th and 12th February 2012. FIRA, an apex body of more than 75 rationalist, atheist, skeptic, secularist and science organisations in India., is committed to the development of scientific temper and humanism in India.. The Federation is affiliated to International Humanist and Ethical Union (IHEU). The conference will be hosted by Akhil Bharatiya Andhshraddha Nirmoolan Samiti (ABANS), one of the founding members of FIRA. “The two day FIRA National Conference will be the convergence of all Rationalists from almost all States of the Country. This will be a unique opportunity to listen and gain knowledge from the discussions and deliberations carried out by the Functionaries of the Affiliate Organisations”, says the organizers. The Akhil Bharatiya Andhashraddha Nirmoolan Samiti, Nagpur, founded by Prof. Shyam Manav (National Organiser), is a humanistic organisation registered way back in 1986 and working for eradication of blind belief since the year 1982 and because of its numerous exposures in the early days the city of Nagpur has earned the nick name of “POLKHOL CITY”. This Samiti is a founder member of Federation of Indian Rationalists Associations (FIRA). The two day FIRA National Conference will be the convergence of all Rationalists from almost all States of the Country. This will be a unique opportunity to listen and gain knowledge from the discussions and deliberations carried out by the Functionaries of the Affiliate Organisations. It is proposed to bring out a Souvenir on this occasion containing Articles of Rationalists, Humanists both in- land and foreign which will surely remain as a Treasure for all Rationalist Thinkers and Activists attending the Conference. WE INVITE YOU FOR THE TWO DAY CONFERENCE. PLEASE ENROLL YOUR SELF AND OTHER ACTIVISTS OF YOUR ORGANISATION AS DELGATES IN LARGE NUMBERS. Delegate fee is Rs. 200 per delegate which includes food and accommodation charges. Activists desirous of attending conference may send advance intimation by mail/email. The conference proceedings shall take place at Ramgopal Maheshwari Sabhagruha, Mor Hindi Bhawan, Rani Jhansi Chowk, Sitabuldi Nagpur. 1. Arrangement for your stay has been made at 4 / 6 bedded dormitories at Century Hotel, Ghat Road, Cotton Market, Nagpur 440018. Fax No. 0712-2737900. Phone No. 0712–2729258, 0712-2725248. 2. Food (breakfast, lunch and dinner) on 11th and 12th February is arranged at Rashtrabhasha Bhawan, North Ambazari Road, Nagpur 440010, which is at a walking distance (10 – 15 minutes) form the Conference venue. 3. Registration of delegates shall start at 8.00 am on 11th February at Conference venue. 4. Separate accommodation, if desired, can be arranged on payment by the delegate at following rates: Rs.200 for single bedded room and Rs. 250 for double bedded room. This is the first time that the Rationalist Fraternity from all the States of India will be meeting at Nagpur, the land of Akhil Bharatiya Andhshraddha Nirmoolan Samiti. The Samiti shall be working tirelessly so that you shall have a pleasant stay and meaningful interaction during the entire Conference period. NOTE: The delegates are expected to reach Nagpur on 10th evening or 11th early morning. From the main Railway station auto rikshaws are available @ Rs. 30 per auto from the eastern (Santra Market) side and @ Rs. 40 per auto from western (Sitabuldi) side to Century Hotel. Tea and meals for 10th February shall have to be arranged by the delegates themselves. NOTE: The 8th National conference of Federation of Indian Rationalists Associations shall start at Nagpur on 11th February 2011. The delegates are expected to reach Nagpur on 10th evening or 11th early morning. From the main Railway Station auto rikshaws are available @ Rs. 30 per auto from the eastern (Santra Market) side and @ Rs. 40 per auto from the western (Sitabuldi) side to Century Hotel where stay for delegates is arranged. Tea and meals for 10th February shall have to be arranged by the delegates themselves. 4 members are participating from our Society and are reaching Nagpur on 10th night at 0900 PM. That's nice. Hoping to meet you at the Nagpur Conference. Hope this would add values and meaning to understanding rationalism to make the event more meaningful and successful.